The 22 Series was created to bring the most popular guitar tonewood combination of spruce and rosewood to the ukulele. 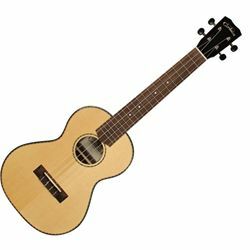 The 22T is a tenor sized ukulele featuring a solid spruce top paired with rosewood back and sides, rosewood bridge, fingerboard, and headstock veneer, and mahogany neck. The aesthetic is subtle and refined, with a sleek high gloss finish, and timeless hand inlaid wooden rope rosette and matching purfling.